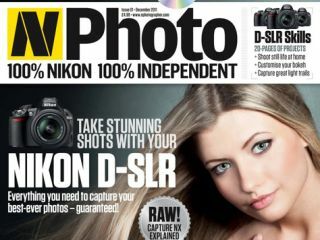 The publisher of TechRadar, Future Publishing, is launching a new Nikon specific photography magazine, N-Photo next month. Launching on 24 November in both print and digital form, N-Photo has been designed to show Nikon photographers of all skill levels how to get the best from their digital camera to take fantastic shots. There's also features on Nikon-using professionals, inspirational images and in-depth gear reviews from our independent camera testing team, who also create the camera and photographic reviews on TechRadar. Step-by-step tutorials are included to guide readers through creative products, while the "Nikopedia" has been created as an invaluable reference section for all Nikon owners. Not only that, but there's also a free coverdisc, which features video tutorials linked to features in the magazine, such as shooting skills, photo editing techniques, kit reviews and more. The new magazine is headed up by Chris George, who says, "Photographers are passionate about the camera system that they use - and they love brand specific advice." N-Photo joins the other magazines in our photography stable, which includeds Digital Camera, Practical Photoshop and the Canon specific PhotoPlus. Nikon sales are growing, with more than 14 million digital SLRs sold in the last financial year and recently launched its first compact system camera series. The first issue of N-Photo will go on sale on 24th November, priced at £4.99 including the cover disc. Digital editions will also be available via Zinio and on the Apple Newstand.